From one of Epicurious' Greatest Home Cooks of All Time, deliver creative and delicious weeknight dinners with this quick and easy cookbook for beginners and foodies alike. At Christopher Kimball's Milk Street, Tuesdays are the new Saturdays. That means every Tuesday Nights recipe delivers big, bold flavors, but the cooking is quick and easy--simple enough for the middle of the week. Tuesday Nights is organized by the way you cook. Some chapters focus on time--with recipes that are Fast (under an hour, start to finish), Faster (45 minutes or less), and Fastest (25 minutes or less). Others highlight easy methods or themes, including Supper Salads, Roast and Simmer and Easy Additions. And there's always time for pizza, tacos, "walk-away" recipes, one-pot wonders, ultrafast 20-minute miracles, and dessert. 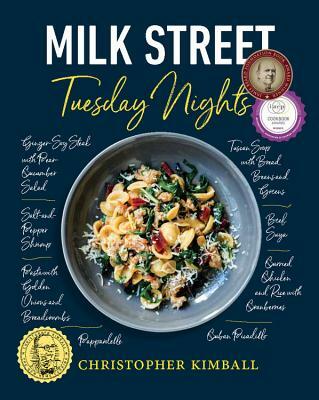 Christopher Kimball's Milk Street is located in downtown Boston--at 177 Milk Street--and is home to a cooking school, a bimonthly magazine, and public television and radio shows.